It’s the most wonderful time of the year! Or so the classic Andy Williams song goes. Yes we have our parties for hosting, marshmallows for roasting, and carols to sing. Advent is here, the hustle and bustle is all around us. It really is a magical season. In the Christian tradition, advent comes as the period of waiting before the season of Christmas. This year, Advent starts on December 2nd. It is the period where we celebrate and anticipate the arrival of the baby Jesus and all the hope, peace, love, and joy that he brings. For us modern Christians, we also spend this season anticipating his returning. To celebrate advent, we light the advent wreath. A circle of evergreen garland with 5 candles mixed in, one for each Sunday and the Christ Candle in the middle that will be lit on Christmas Eve to symbolize his birth. The three purple candles, and the pink candle remind us that each week the anticipation grows and grows, as does the light, culminating on that magical night where we all feel like kids again. Between now and then First Christian is going to be a busy place. Our theme for this year is “Stories of the Season” as told to us is several ways. We will explore stories that excite us, build our anticipation, come to us in song, give us new life, and light our darkness. We will be blending stories of our lives with those of scripture as we hear the familiar story once again. Be sure to mark you calendars for “Brunch Sunday” as we worship through song on December 16. We will have a lessons and carols service followed by a brunch from Waffle House. In addition to our worship we have sever other opportunities for you to get connected and get involved this advent season. We have a special opportunity to connect with the Interfaith Hospitality Network (see page 2). 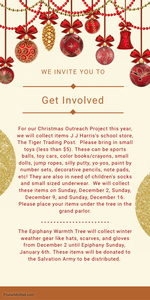 We will once again be collecting items for the Epiphany Warmth Tree (through January 6) as well as our Christmas project- collecting toys for the JJ Harris School Store. For this project, we are looking for small toys (under $5) like sports balls, toy cars, color books/crayons, small dolls, jump ropes, silly putty, yo-yos, paint by number sets, decorative pencils, note pads, etc. You can leave them under the tree in the parlor. For all the rest of the Advent/ Christmas celebrations and information read this newsletter! Peace be with you this blessed season.